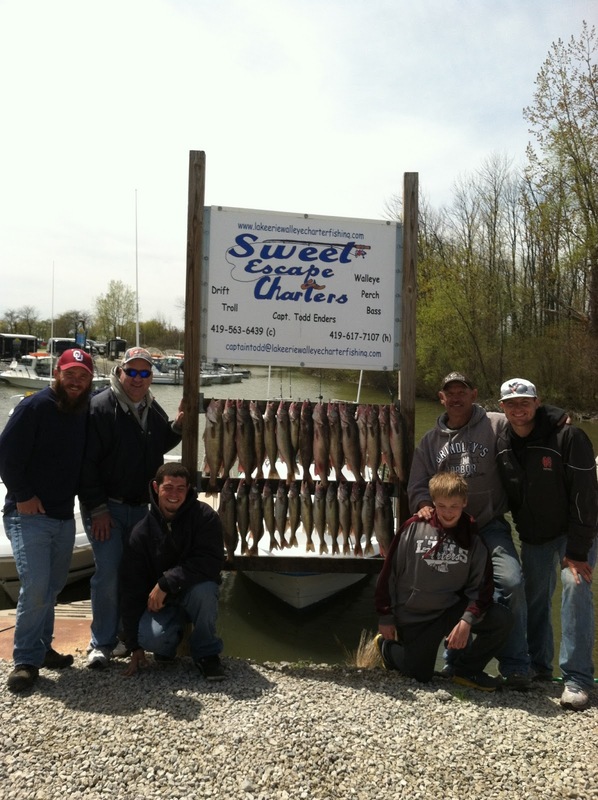 Sweet Escape Charter's communication with its customers and current fishing reports for Lake Erie walleye and perch charters. 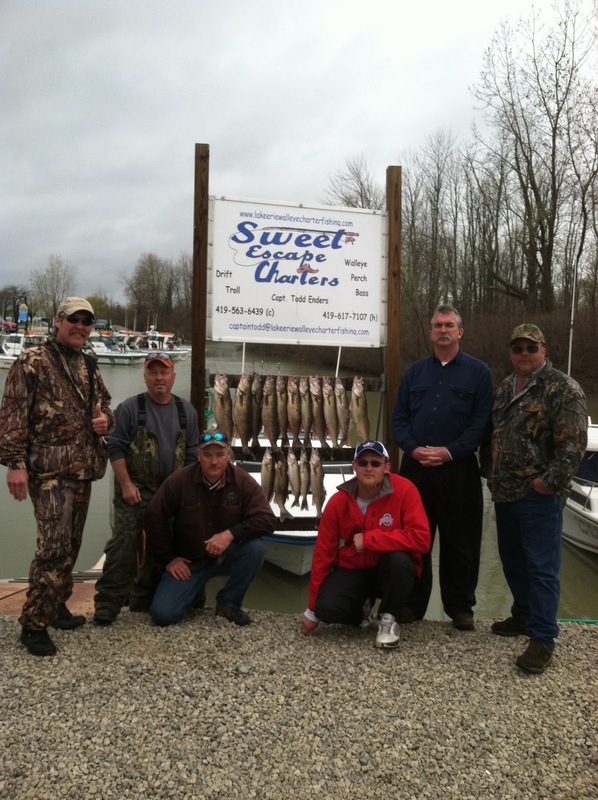 Sweet Escape Charters runs fully guided walleye and perch charters on Lake Erie's western and central basins out of Wild Wings Marina, Oak Harbor; Anchor's Away Marina, Port Clinton; or Huron Boat Basin, Huron. 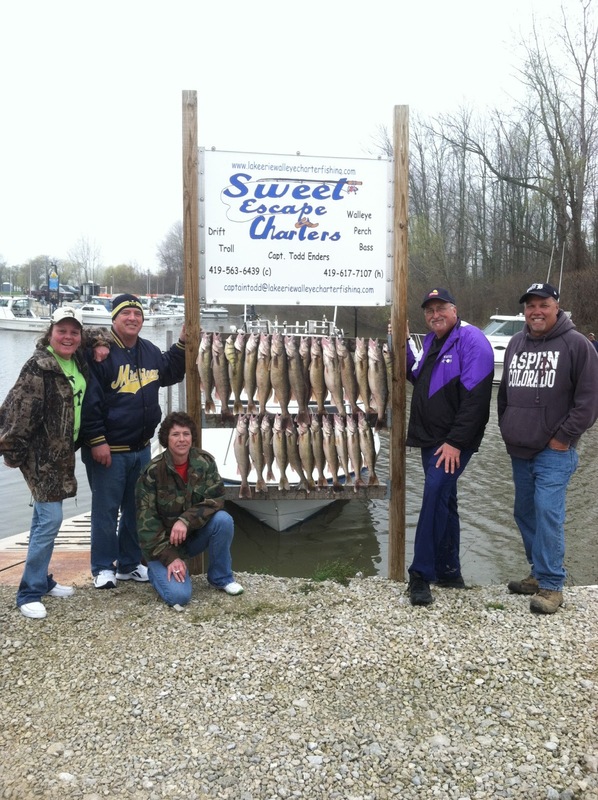 Call us today at 419-563-6439 to book a great charter and "Make Memories Limit After Limit". School spring break yields 4 great days of walleye fishing aboard Sweet Escape Charters. 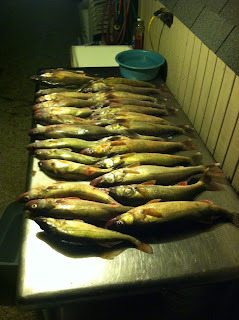 April 17 - Took a limit of 12 walleye jigging on Touissant Reef. The bite was really slow due to a cold front that went through earlier in the week, but we managed to get it done with some perseverance. 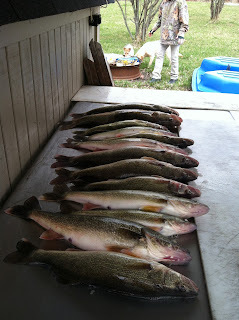 All walleye were captured on purple hair jig without minnows. 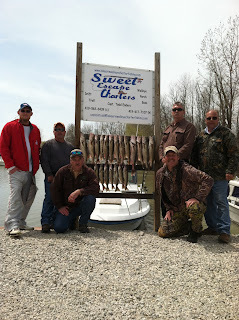 April 18 - Took another limit of 12 walleye jigging. The day started on Touissant Reef before the boat traffic slowed the bite. We moved out to Niagara Reef and captured are remaining walleye. Again, all walleye were caught on purple hair jigs in 19 feet of water. 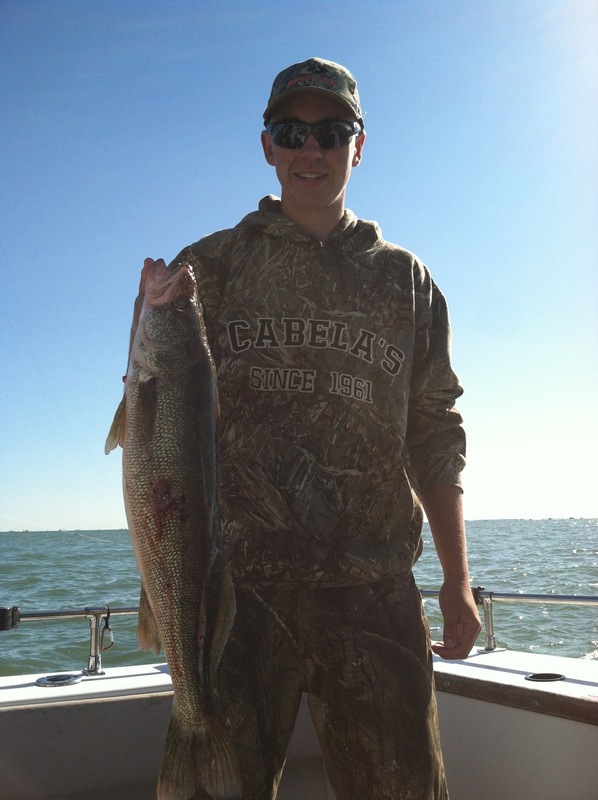 Numerous other walleye were caught after limiting rather early in the morning. 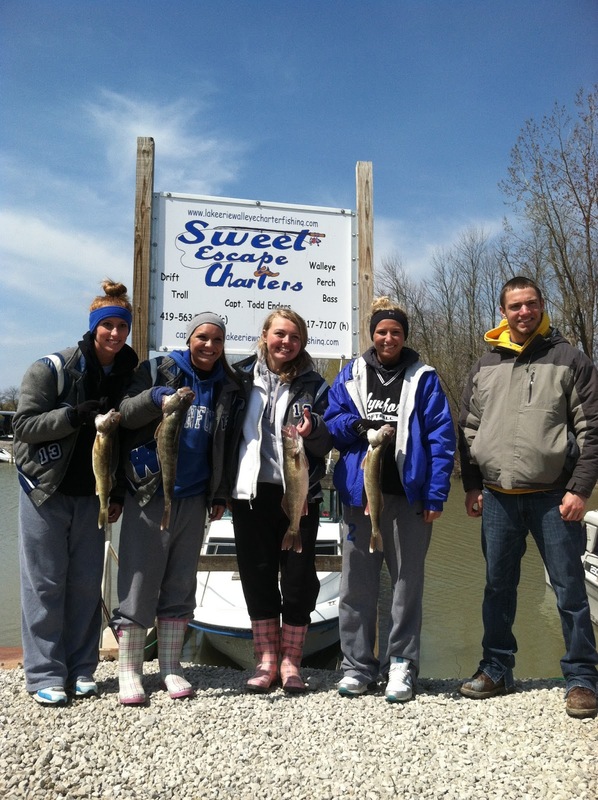 April 19 - Trip was cancelled due to unfishable water due to a brisk northeast wind. 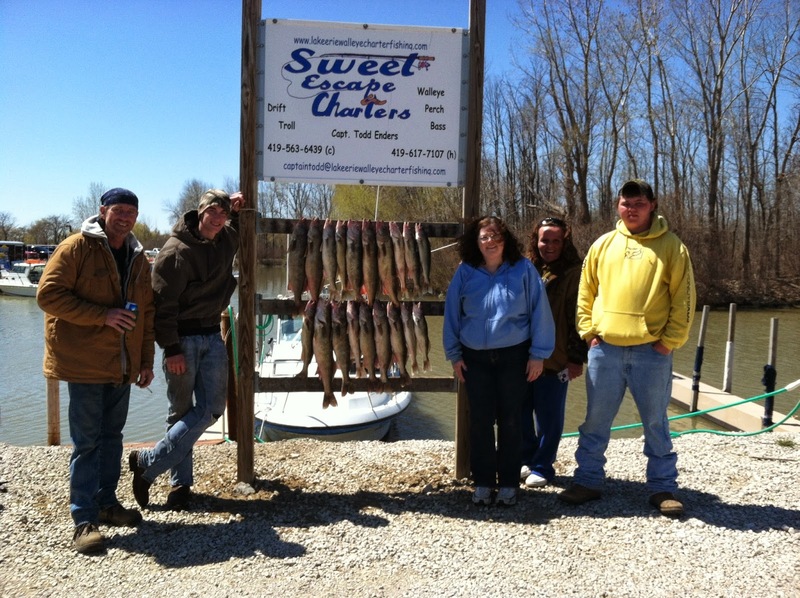 We did manage to get out later in the afternoon after the winds let up doing some fun fishing with other captains and members from the camp ground. 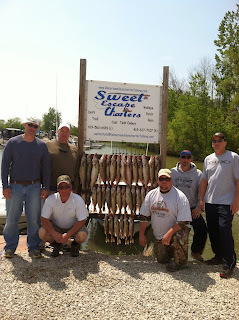 Left the dock around 3:00 p.m. and took our limit of 20 walleye finishing around 6:00 p.m. 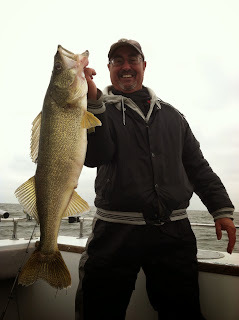 Started jigging on Cone Reef only capturing a few walleye before heading to Niagara Reef to finishe the day. Walleye were caught on a variety of hair jig colors. April 20 - Back on the water again aboard Sweet Escape Charters heading to Niagara Reef for another awesome day of jig fishing. Action was really good with most fish coming in the deeper water on the northeast corner of the reef by the grren can in 23-26 feet of water. A limit of 24 walleye were caught using hair jigs without minnows. 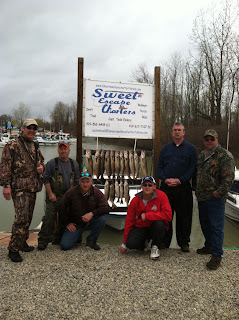 April 26 - Another good weekend of Lake Erie walleye fishing. Only heading out on weekends now until school lets out. 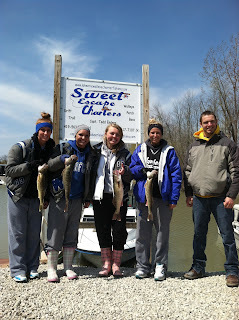 Had a group of 6 on Saturday and the fishing was pretty tough all over the lake. We managed to capture 19 walleye working south east of K-can in early morning and moving to Touissant Reef to finish the day. Mother nature is not cooperating with us this spring. We need some southwest winds and some warmer temperatures to move in. 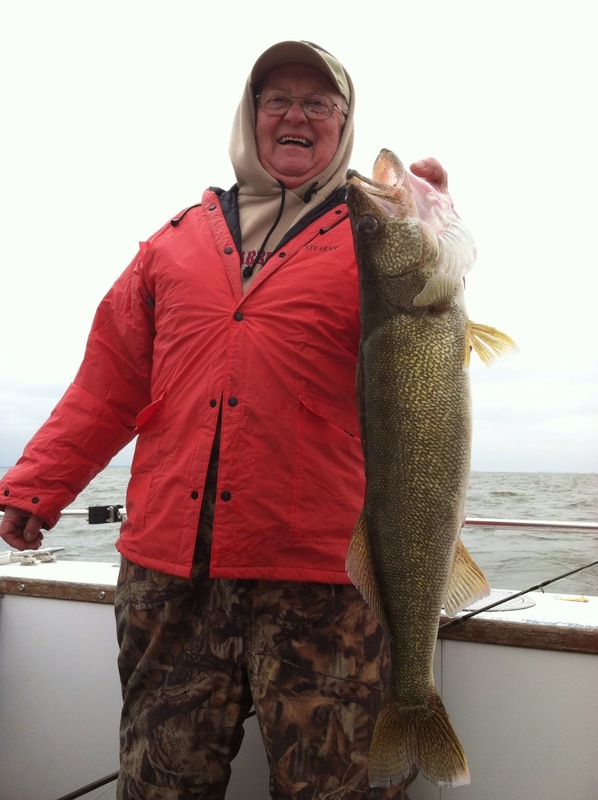 It appears that many female walleye have finished spawning as trollers are taking some very nice walleye using huskie jerks and reef runners. 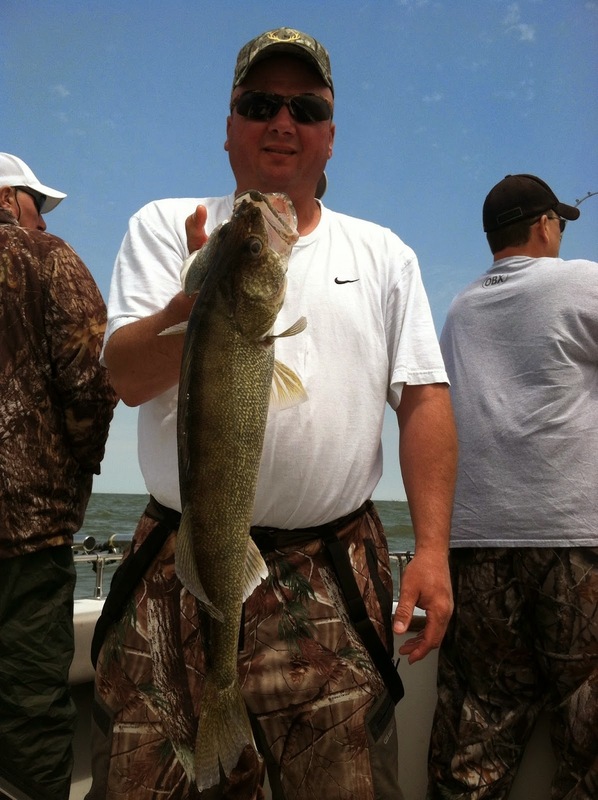 The walleye may be moving into the transitional period after the spawn. We did managed to capture a few sheepshead jigging over the weekend. April 27 - Fished Touissant Reef and caught the 12 walleye needed for a limit. It was another day of northeast wind, muddy water, and waves. Mother nature! Please give us some warmer temperatures and a stable weather pattern. Probably will need to begin switching from jigging to crawler harnesses and/or trolling very soon. Hope the casting bite hangs on for some time and we can keep the trolling gear in the cabin. If you would like a chance to be a part of the hot walleye charter action on Sweet Escape Charters, give us a call (419) 563-6439 and book your charter. Fishing was great this Memorial Day weekend aboard Sweet Escape Charters. On Saturday, we captured 42 walleye trolling southwest of D-Can using scorpion stinger spoons on 40-50 ft leads. Day started off slow but ended with a bang. On Sunday, we had a short crew of 4 guys and myself. 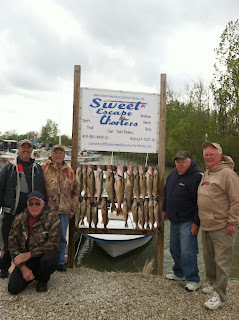 We got our limit of 30 walleye caught trolling with scorpion stinger spoons on 40-55 ft leads. Started the morning off in the same location as Saturday but could not get them to bite. Head a little nortwest of the area towards Flatrock Reef and got into some very nice fish. No pic of the limit but most of the walleye caught were around a 5lb average like the one Johnny has here. 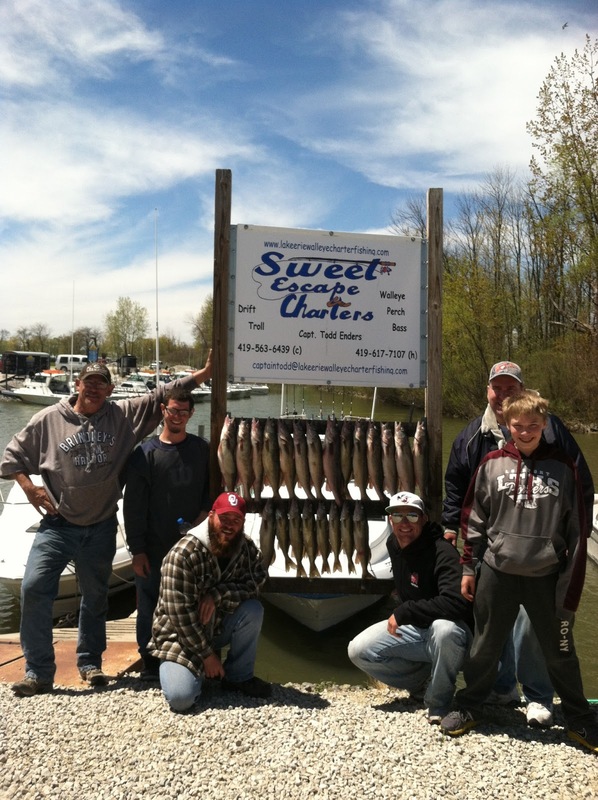 On Sunday, the same group managed to capture another limit trolling northeast of Niagara Reef in 30 feet of water. Had to move the leads a little deeper to 60-75 ft leads. 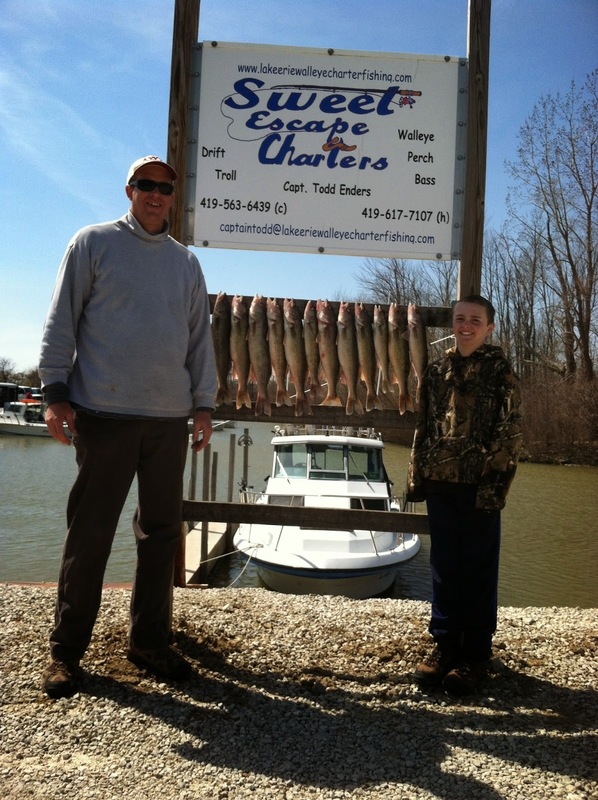 Finished the day around 11:30 a.m. Johnny and Spider wanted to pose with some awesome Sweet Escape Charters attire and show the great time they had catching some great walleye. Walleye fishing is beginningbto pick up. Water temperatures have finally climbed to a comfortable temperature to bring the eyes out of their transitioning period after the spawn. 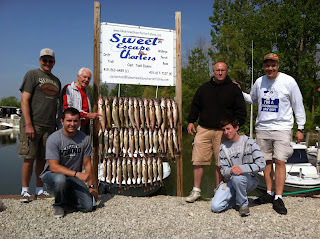 On May 11 and 12 with the Barnes crew we ended up capturing 22 eyes on the 11th and 28 eyes on the 12th. 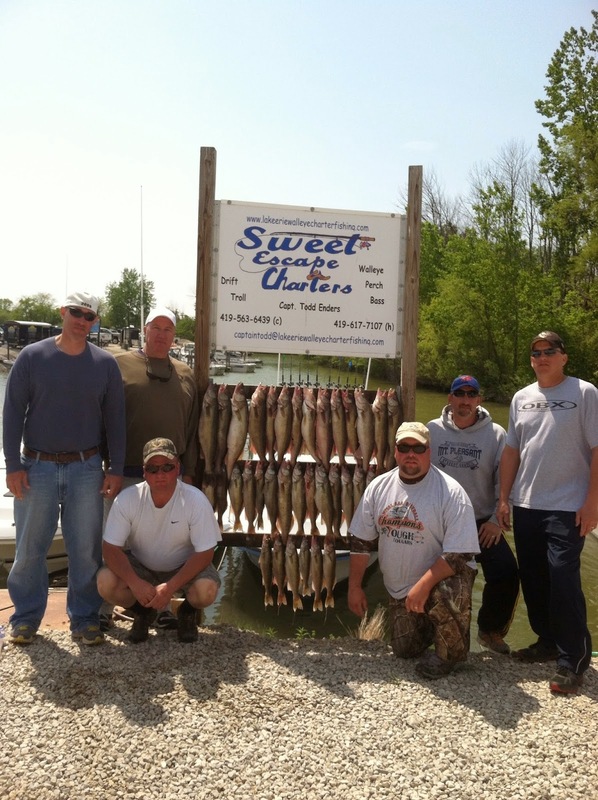 All walleye were caught trolling with stinger spoons. On May 17 and 18 we manage to get 28 eyes on the 17th and 36 eyes on the 18th. Here are some pics of those trips with the Barber crew. Yesterday on May 19th we managed to capture 42 eyes with the Sabel crew. All fish were caught trolling with scorpion stinger spoons. We have been moving all over the lake to find the active fish. Yesterday we were finished at 9:30 am. Well the spring has been anything but normal. 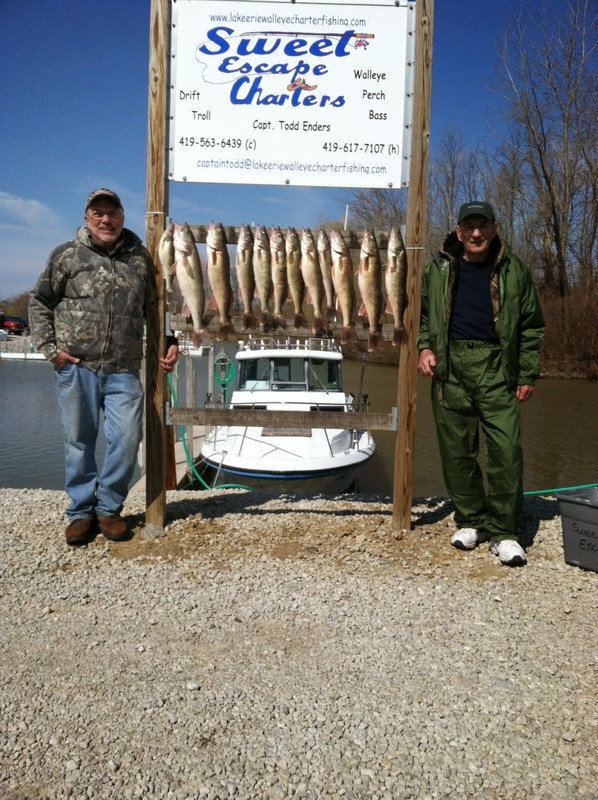 We have struggled to catch limits of fish so far this spring. I think mother nature has contributed to most of this disappointment. 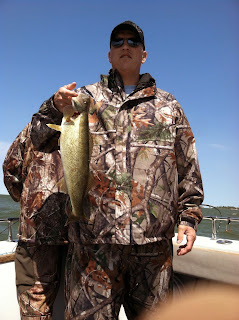 We have still managed to catch walleye but it has been work and nothing has came fast. Customers will be happy that they are getting their 8 hours of fishing but upset that limit catches are not being produced. Hopefully the walleye get out of their closed mouth syndrome and begin biting. For the customers sake bring your fishing shoes and all the tactics that you got. We will need to work hard capture what we can. 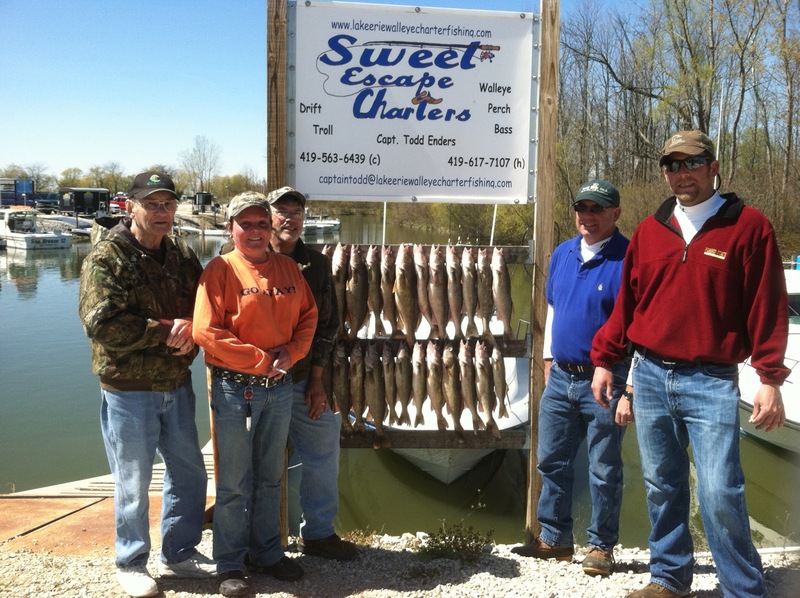 The fish that are being caught are very nice walleye ranging anywhere from 16" to 30". 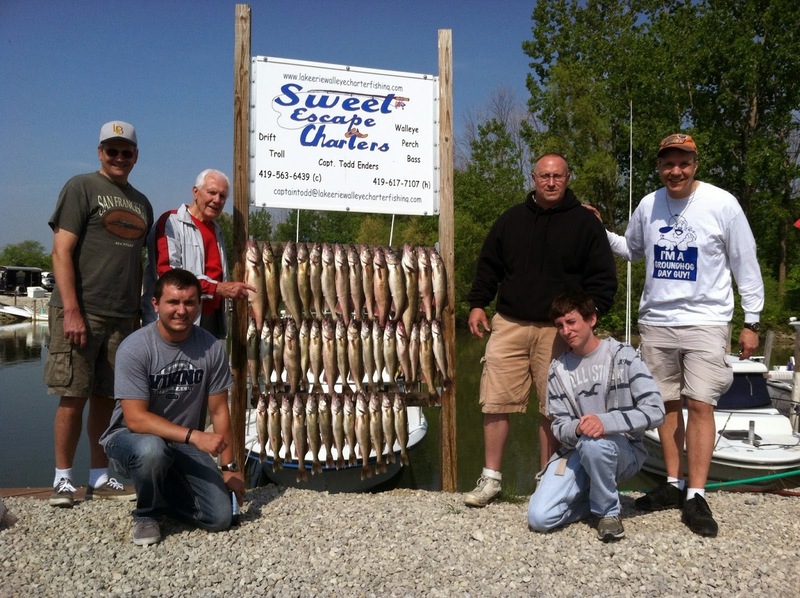 Here are some catches mid from mid April thru first weekend in May. 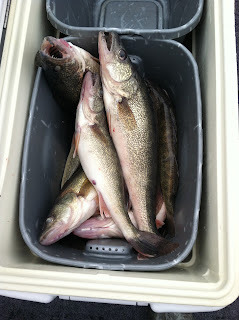 Well 4 of us finally got out on a decent morning with no wind and managed to capture 13 nice walleye. The morning bite was much better than mid morning. 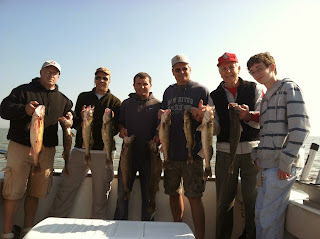 We had 11 of our fish by 9:30 starting around 7:30, the remaining 2 walleye came very slow quitting around 1:30. 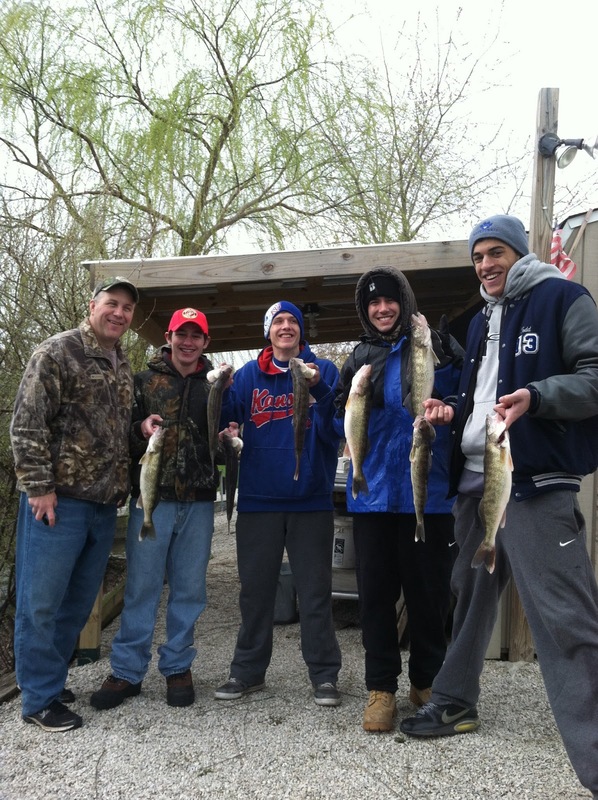 Overall we had a great day and fishing partners were great. Walleye were caught on jigs with no minnows and captain j's blade baits East of K-Can in 13 fow. Hope the weather cooperates because the official trips start Saturday. Other reports from charter boats ranged from about our same numbers to a few limit catches from the group of charters I work with. I hope mother nature decides to give us some stable weather and backs off on the blowing wind. 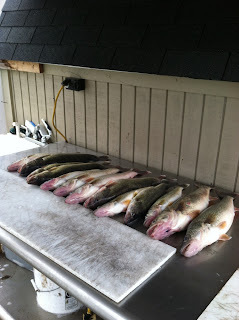 Here's a couple of shots before the walleye hit the knife and head to the frying pan. Still have dates open during the month of June. 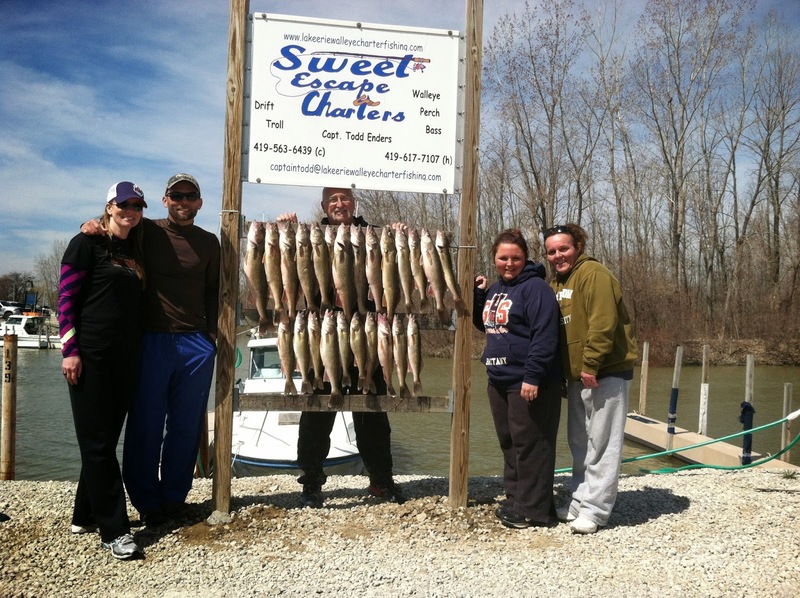 Call Sweet Escape Charters to book a great Lake Erie Walleye Fishing Charter. Since I am a school teacher, I do not have the luxury of walleye fishing during the week. I began to think of others that want to go jigging for walleye during the week but can't take off work either. So here is what I came up with. 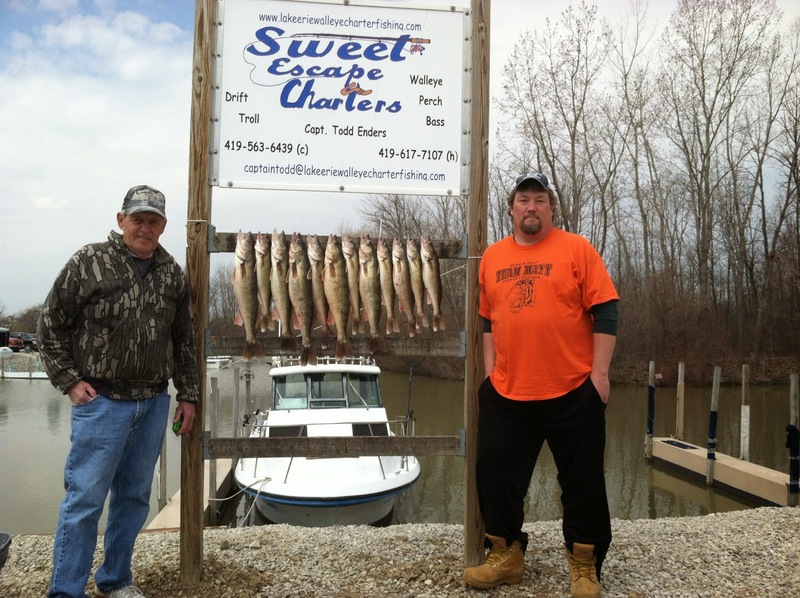 I live about an hour from the lake and willing to drive up to the lake for an evening Lake Erie Walleye Charter on Sweet Escape Charters. The evening jig bite can be just as good as the early morning bite. So, if anyone is up for this, you need to visit our Contact Us page and give us a call to get it set up. These trips will be walk-on type trips. (must call prior to day of fishing to make arrangements). Trip may be a mixed group of members from different parties. Time: 4:30 till dark or limit. So what are you waiting for. 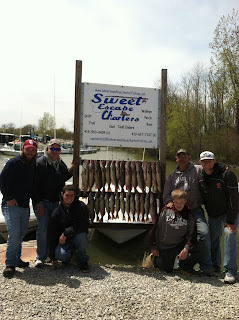 Call today to get your exciting jig fishing charter on Lake Erie aboard Sweet Escape Charters. Relax after a hard days work catching walleye. Well, I checked out the satellite image of Lake Erie today and the ice looks to be gone. 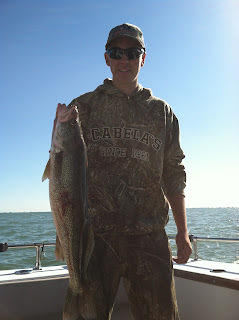 Lake Erie walleye fishing shouldn't be to far away now. Reports from the Maumee River are reporting a few walleye being caught. With the ice gone, the water should begin to warm up and walleye should begin their journey up the river to begin spawning. Hope mother nature cooperates with the weather and temperatures begin to get back to normal ranges for this time of year. 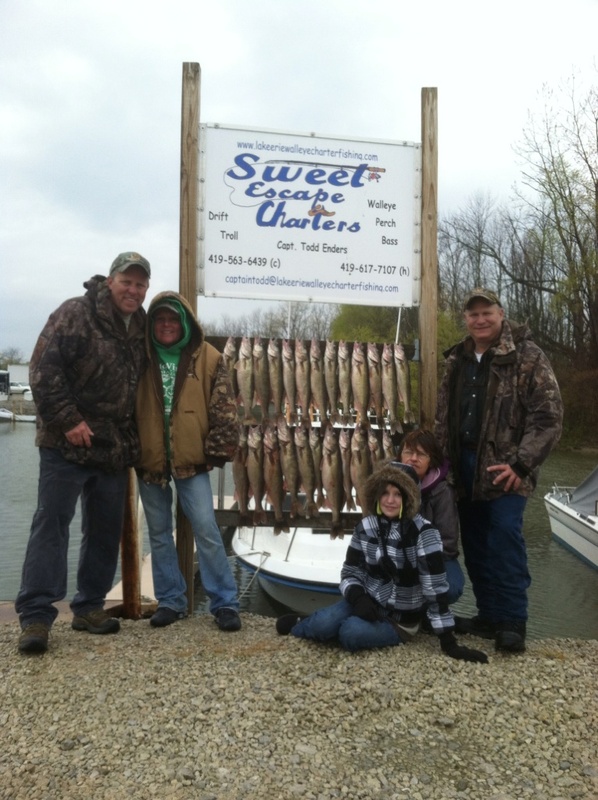 Sweet Escape Charters will not be long behind the tracking of the walleye on Lake Erie and start jig fishing if mother nature cooperates. 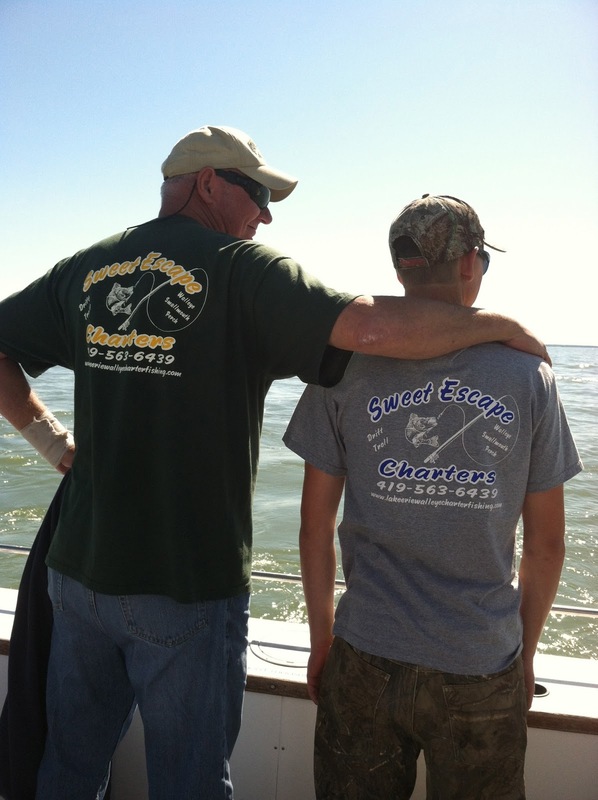 Sweet Escape Charters will be posting fishing reports of jig fishing trips running out of Wild Wings Marina during the jig bite. Lake Erie Walleye Charter Fishing has great days and fishing opportunities available aboard Sweet Escape Charters to take part in the fun and exciting action of jig fishing. Give us a call and book your trip today so you don't miss out on all the fun. We have lodging available and great rates. Call Now! 419-563-6439. 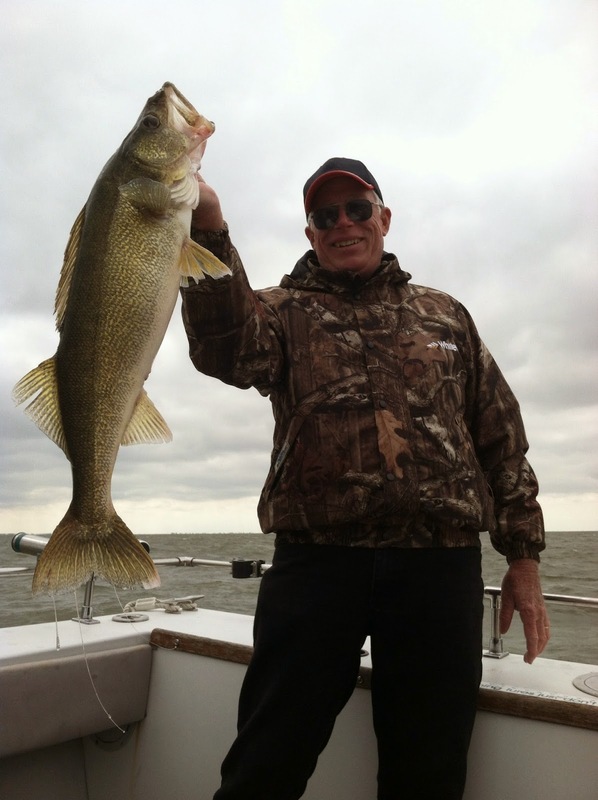 Temperatures are warming up and so will the walleye fishing. Sweet Escape Charters has opening on weekday charters during the month of June (best walleye fishing). 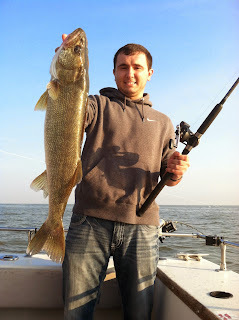 Give Lake Erie Walleye Charter Fishing a call to book your charter today. Ask about our weekday specials. Call today at 419-563-6439.